Last week I was able to get out for a few hours on a local river to wet a line for the first time in a couple of weeks. The water was cold, the fish were pale, and the bite wasn't easy. But over the course of the morning I was able to grind out 16 bass...and I mean grind. The nice thing was that they were almost all in the 3 to 3.5 lb range with the biggest going about 4 lbs. There was no real pattern and it was a sure sign that the fall, junk bite had arrived. By "junk bite", I mean you have to throw half the junk in your tacklebox to come up with a limit of fish. 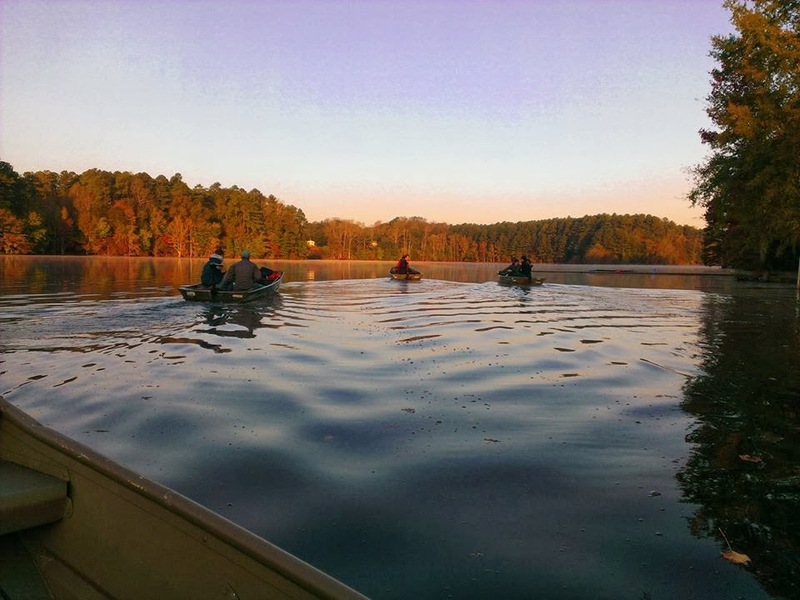 I kept that in the back of my mind as I started to prepare for yesterday's Duke-UNC Charity Tournament that UNC held on University Lake - a public lake on the Chapel Hill-Carrboro border. I knew the cold morning temps would surely have the fish looking for areas to stay warm, but honestly, I wasn't 100% sure where that would be - shallow, deep, or scattered. I had only fished the lake twice before and only in the spring. I marked a number of places on a map that I thought would produce and was confident in being able to fill a limit. But, limits can be a tricky thing when the morning temps hover around freezing. 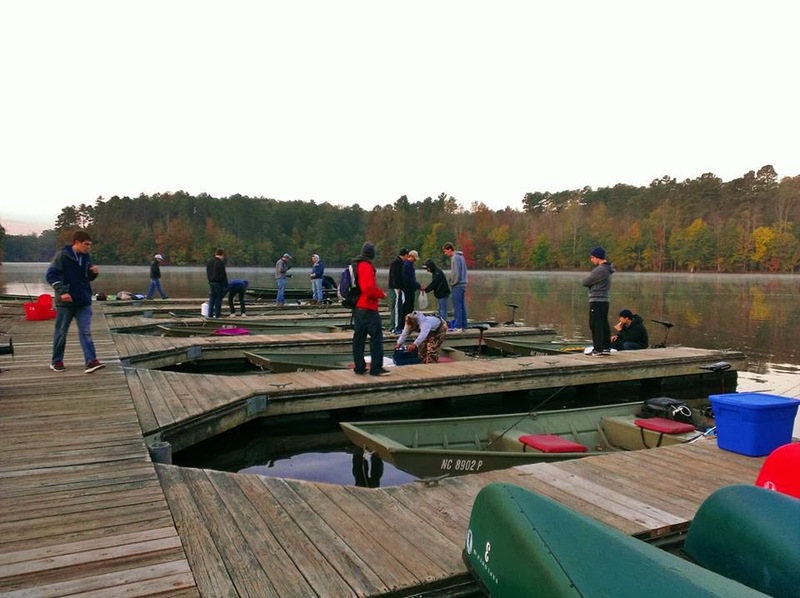 Pre-tournament, I prepped some of the new guys to the Duke Fishing Club and put together tackle boxs, plastics, and rods for the guys who didn't have gear on campus. Of course, I prepped my own gear as well, opting to start with a buzzbait, squarebill crankbait, jerkbait, and plastic worm. When tourney day came, it was up early and out the door around 5:30 AM. The air temperature was much nicer than previous days, reading 46 on the Escape's thermometer. It had been 26 degrees at 7 AM the morning before as snot ran down my face while in the treestand. There were more teams than normal for both schools - 11 for UNC and 6 for Duke. My partner for the day was Dean, a freshman biomedical engineering major. It was his first ever tourament and his previous bass fishing experience was minimal. I was trying my best to give him tips while not overloading him with fishing, because I can get pretty single minded when on the water. The limit was set at 3 fish over 12". I would have preferred the 5-fish limit that the tourney typically uses, but I knew it would give more boats a chance of pulling a limit, which in an event like this is a good thing. Who would pull off the winning, 3 fish limit? Everyone finally got settled and we launched around 8:15 AM. We motored across the lake to a point on the inside of a channel bend with some stumps on it. I began throwing a buzzer and jerkbait while Dean threw a popper - nothing. Next we moved down a clay bank fishing wood cover and cranking rock - nothing. Then we went to the back third of a creek arm and flipped and cranked shallow - nothing. It was about 9:45 AM and for the first time all day, the wind was picking up. We decided to move back toward the main lake. On the way, we saw a bass blow up shad in the middle of the lake. That was kind of the key to our day in a way. I realized that most of the bass were still in the deep channels due to the cold snap. Since no-one had fish finders, fishing deep or on drops was nearly impossible, but it eliminated a lot of water. We would just have to fish areas that if those deep fish started to scatter, would be prime transition spots close to the channels and with bait around. I decided it was time to go do the most stereotypical thing to do in the fall - crank a wind blown rip-rap bank. I set up Dean with a lipless crank and I began fishing a medium diver. 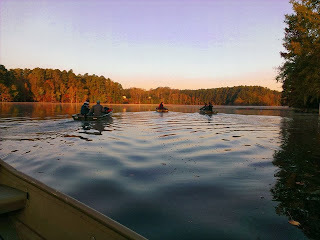 There were a couple other boats around the rip-rap, but we found a spot that was out of their way and started fishing. I noticed further down the bank was a portion of rip-rap that was recently re-done. I told Dean those types of spots are either great, because new rocks fall into the water creating new spots for bait to hide, or terrible, because the construction caused so much disturbance that the bait and fish need a while to acclimate to it. Thankfully, it was the former. My second cast to the new rip-rap section produced a 16" bass that got the skunk out of the boat. Things were looking up. We then made a move into the outter third of creek arm, characterized by a funnel area and large pocket. We fished around the pocket, targeting rock cover and off-shore wood in 5-8 feet of water with crankbaits. As we got to the deeper side of the pocket, I began flipping plastics into wood cover. I dropped my bait between a log and a big pine limb, let it sink, popped it off the bottom, and I felt the "tick" as it fell back down. "Fish", I exclaimed. After a short fight, we landed the 15-incher and were excited to have 2 in the (makeshift) livewell - a rubbermade container with an aerator hanging off the side. Minutes later I flipped to another shallow tree and immediately a fish picked up the bait and took off with it. I caught up to him on the reel, but didn't get a great hookset because the line was partially under a limb. The fish charged toward the boat and looked like a solid 3-4 pound bass. As I reached down for the net, he changed direction and a slight bit of slack formed in the line. The hook popped and the fish was gone. It took every bit of energy to hold in the profanity that sat on the edge of my lips. I mentioned to Dean about how important execution is when tournament fishing. Losing fish, not re-tying your line, tying bad knots, etc. can easily lose you a tournament if you don't pay attention to detail and execute. 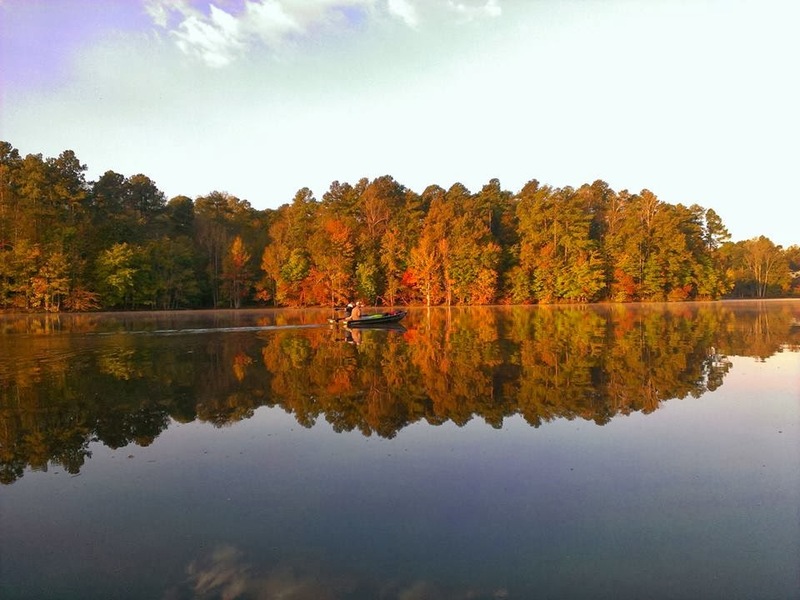 I was kicking myself, but I re-focused and we went back to fishing. We eventually circled back around the pocket to the rip-rap wall. I began cranking parallel to the wall and - BAM. A bass inhaled my squarebill as it deflected off a rock. The crankbait was eaten frontward, with only the back treble sticking out of his mouth. Because he ate the bait funny and had a hook that nicked a gill, I was worried our little livewell might stress him too much. Thankfully, on the next cast, I landed another bass. The fish was probably half a pound smaller than the previous fish, but I knew the previous fish would have a better chance of living if we released him instead. So we took a loss on total weight and ketp the smaller bass, but were super excited to to have a limit right at noon. The rest of the day was hit and miss. We caught a few short bass on plastic worms and finally hit a solid 2 lber on a wind blown point. The problem was that when we went to cull, we couldn't tell which was smallest. With the blue walls of the cooler and four fish in it, it was nearly impossible to see the size of each fish, which were all in the 14"-15" range. On top of that, they kept trying to jump out. We decided to just take all 4 back to the weigh-in and sort it out there. As they day came to an end we fished a couple deep banks with no success. Then I noticed something. Because all of the boats typically available for rent were being used by the tournament, the docks were calm, quiet, and empty. On a typical day, they were full of kids splashing, people making noise, and general boat loading/unloading chaos. As we motored toward the docks I told Dean that it would be a brilliant end to the day or a total flop. 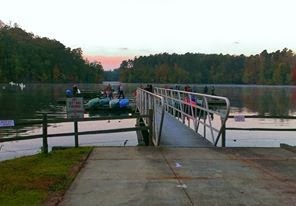 We began fishing down the first row of docks with no luck. But I noticed one particular spot that looked good - right on a sun-shade border with some overhanging structure. My first cast was hurried as the wind blew us by the spot and missed the mark by a couple of feet. After we fished to the shore I flipped the trolling motor into reverse and went back to the spot. As I cast, I turned to Dean and said, "If there is going to be a fish on this dock, it ought to be right here." The cast skipped perfectly into the spot I wanted it to go. I felt an ever so slight tick on the line and started to reel up the slack. Then I saw the line running sideways, reeled down, set the hook, and listened to the drag start to peel. The fish ran under two floating docks before I turned him back toward open water with my favorite rod - the Carolina Custom Rods "Finesse Special". He made multiple charges as he got closer to the boat and ripped drag each time. Finally, Dean scooped him into the net and I let out a huge sigh of relief. I looked at my watch - it was 2:48 PM and the tournament ended at 3 PM. The fish was a beast and we knew that it would probably secure the tournament victory. It reminded me a little of this moment that had us literally jumping up and down on the couch a couple years ago. We fished the rest of the dock structure with no luck and called it a day. As other boats rolled in, I kept the news of our catch quiet until the last minute and even then, only the Duke teams knew what was in the cooler. We had heard that a few of the UNC teams had solid limits, so we weren't sure what to expect. But I felt good, knowing that is was a tough day out on the lake and crossed my fingers. We were the second team to weigh-in and as I lifted the brute from the cooler, everyone started buzzing. Our three fish limit (which actually included a fish smaller than one we let go simply because it was more lively) weighed in around 10 lbs 4 oz on Santosh's massive carp scale. The kicker fish went 7+ lbs and 22.5". We were feeling awfully good. Impressively, the other Duke teams all caught at least 2 fish with two of those teams limiting out. I am not 100% sure of weights, I believe the team of Santosh and Krishan took third place. I was really excited to see the young guys do so well, particularly because I know there were a few lost fish that would have made a big difference for the good guys. The UNC teams then weighed in and had some very nice fish including the second place bag of 7 lbs 4 oz. But it wasn't enough to stop the Duke 3-peat. After a few handshakes and some chit-chat we snapped a group photo and hit the road. 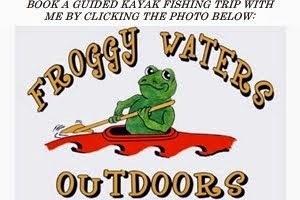 It was another great day on the water with a great group of folks and for a good cause. As the tournament winners, we got to pick the charity where 100% of the money gets donated. It will go to the Schoolhouse of Wonder, a Durham non-profit that does outdoor programs and education for area youth all year long. A big thanks to both club presidents for their hard work, organization, and coordination as well as my partner Dean and all of the other guys who came out to fish. 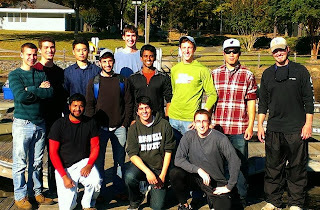 It was great seeing so many Duke participants and I hope the club can continue to keep growing. Current officers Krishan and Brian have done a great job! 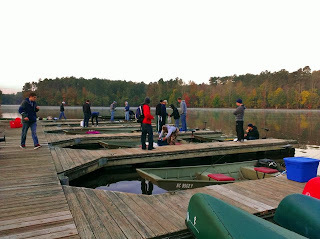 More pictures of the event can be seen here: Duke Fishing Club Event Photos. The Duke team - 3-peat champs! Hopefully I can squeeze in a few more bass trips before winter sets in - then it is crappie season! Until next time, tight lines! Looks like an awesome time for everyone!